The I Am Invincible juggernaut rolls on with the leading sire adding a pair of new two-year-old winners to his tally in Melbourne and Brisbane on Saturday. 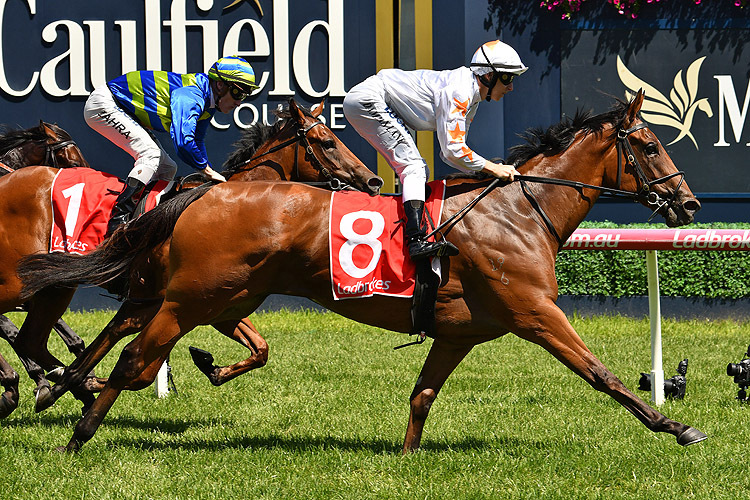 Yarraman Park’s outstanding stallion sired his sixth juvenile stakes winner for the current season when the high-priced filly Loving Gaby won the G3 Chairman’s Stakes at Caulfield at her debut for the Ciaron Maher/David Eustace stable. Living up to high pre race expectations, Loving Gaby surged to the line from the rear of the field to win the 1000m feature in 57.69 seconds, beating her G3 winning stablemate Bella Rosa. Maher and Eustace are enjoying a big season with their 2YOs as they also have the Breeders Plate and Magic Millions Classic runner-up Dubious (Not A Single Doubt) in their stable. A $500,000 Easter yearling sale purchase when offered by Kia Ora Stud, Loving Gaby is raced by Phoenix Thoroughbreds and is their first Australian Group winner. Phoenix Thoroughbreds is headed by Amer Abdulaziz who resides in Dubai. He has emerged as a major thoroughbred investor in the US, Europe and Australasia. Last month Phoenix made a number of high-priced yearling purchases at the Magic Millions Gold Coast sale including the $1.6 million Redoute’s Choice colt in partnership with Aquis Farm. 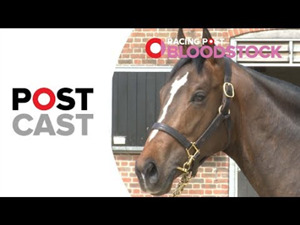 Bred by Kia Ora in partnership with Alan Bell, Loving Gaby is the first foal of the G2 placed Maastricht, a Mastercraftsman half-sister to G1 winner Velocitea (Volksraad) and closely related to G1 Sir Rupert Clarke Stakes winner Orange County (Volksraad). Maastricht has a weanling filly by Sebring and is in foal to I Am Invincible. Loving Gaby is the 42nd stakes-winner in total by I Am Invincible, who was also responsible for the impressive Eagle Farm juvenile debut winner Garibaldi. Trained by Tony Gollan, Garibaldi (I Am Invincible x Sonnenblume by ) is the 10th 2YO winner of the current season for his sire. He was a $475,000 yearling purchase from Carramar Park by the partnership of Boomer Bloodstock, Tony Gollan Racing and Aquis Farm. He is the third winner produced by Sonnenblume, a three-quarter sister to G1 winner Shinzig and Listed winner Strada from the G1 winning mare Shindig (Straight Strike). Carramar Park offers a Dissident half-sister to Garibaldi at next weekend’s Classic Yearling Sale in Sydney. The previous week I Am Invincible sired the winners of both Blue Diamond Previews at Caulfield and he is now this season’s leading 2YO sire by winners. The son of Invincible Spirit is among the most eagerly sought stallions at current yearling sales. He had 46 yearling sell for an aggregate of $24,645,000 at last month’s Magic Millions Gold Coast Yearling Sale. His fee in 2018 was $192,500 (inc GST). I Am Invincible’s first crop sire son Brazen Beau has been represented by exciting juvenile winners Tassort and Accessions. •	KIA ORA STUD enjoyed a big weekend with a G2 winner from their 2017 yearling draft in South Africa on Saturday. Exceed And Excel colt Nafaayes, trained by Mike de Kock for Sheikh Hamdan’s Shadwell, won the G2 Gauthen Fillies Guineas at Turffontein to take her record to four wins from six starts. Nafaayes (Exceed And Excel x Decelerator by Dehere) was a $350,000 buy from Kia Ora's 2017 Easter Sale draft. US-bred Decelerator has a 2YO filly by Snitzel and a yearling colt by More Than Ready who made $200,000 at the recent Magic Millions. Kia Ora also bred Rotator, a $270,000 Not A Single Doubt filly who was narrowly beaten on debut in the G3 Widden Stakes at Rosehill. Kia Ora will offer a brother to Rotator at the Melbourne Premier Sale next month. Race Synopsis: Ciaron Maher and David Eustace-trained fillies fought out the finish with Loving Gaby doing best in a highly promising debut. She was slow to move from her good barrier (2) and settled in last place in the nine-horse field before improving along the inner at the home turn. She then switched between runners at the 200m and went on to score a soft win at the post. She looks a classy filly. Her stablemate Bella Rosa raced in second place, tracking the free-going leader (Lanigera), was a bit green in the straight and then fought on very well for (half-length) second. Godolphin's filly Lanigera ran along at a quick tempo, held a break at the 200m, only weakening in the latter stages for third after running a bold race. Lindsay Park-trained filly Swan Island was eighth rounding the home turn and made late ground for (2.6 lengths) fourth, Phillip Stokes-trained Done By Me also ran on well from last at the home turn for (2.8 lengths) fifth with Art Collection (3.1 lengths) sixth, making ground after being held up in the home straight.